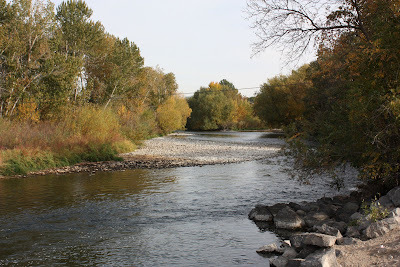 An autumn view of the Boise river, looking east from Glenwood. Yesterday morning, I saw people standing in the middle of the river - fishing. No one around yesterday afternoon. The stream of life is never alone. Just looks like that. Nice photography. Looks very peaceful. Nice place to spend the day. I know this spot well. I was raised in Boise. Just stumbled upon your blog and plan to add it to my Bloglines subscriptions. I'm looking forward to seeing more of my childhood home through your eyes. Don't you just love fall along the river?